All Star Plumbing is an experienced plumbing company based in Columbia, MO. Let us be your choice for expert, timely, and affordable plumbing services each and every time. It’s not about how many jobs we can get done in a day; it’s about the quality of every job that we do. All Star Plumbing treats our customers like family, and we aim to be the first call when something goes wrong so we can be there to help. From installations, service and repair, or routine maintenance, All Star Plumbing is ready to be your solution in Columbia, MO and surrounding areas. We want to educate our customers on preventative measures and methods they can use when emergencies arise. The size and speed of the job is not our focus, our focus is the quality of the work provided! Rob has been in the industry for over 20 years and has provided high-quality service to his loyal customers since 1995. Rob is one of only a few master plumbers in the Columbia area. Others call themselves “expert” where Rob is a true master of his craft. Every job is handled with diligent craftsmanship and a friendly attitude. 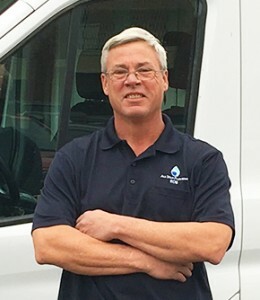 When working with Rob, you can expect a quality relationship that will solidify All Star Plumbing as the team to call when you need plumbing services. Our experience with Rob was amazing! He is very knowledgable and saved us (what could have potentially been) a lot of money. He even gave us recommendations on things to help us out in the future. Being recent first-time homebuyers, we greatly appreciated this. We now know who to call for all our plumbing needs! We have used Rob for several plumbing jobs and he has been great! Knowledge, efficient, and he does quality work! He is also courteous and professional. We feel very fortunate to finally have found a plumber we can trust. His prices are super reasonable too. Give All Star Plumbing your business. You will be glad you did! So grateful for All Star Plumbing! Rob was a lifesaver and replaced my entire water line and installed a new shut-off valve for a reasonable rate. He was kind, honest and trustworthy and got the job done quickly and efficiently. I would highly recommend him and absolutely plan to use him for future jobs! Courteous, knowledgeable, timely, reasonable, professional service! Thank you! Fantastic. I contacted All Star and got an immediate reply. Rob listened to what the problem was and found a great solution. Within about 48 hours time everything was fixed. He went above and beyond to find a great solution. Quality of work is great and affordable and he was very fast. We will be calling him again. I was completely satisfied with the service provided. Rob called when he was on his way to our house. He replaced 2 outdoor spigots in about an hour, despite plumbing that was not easy to reach. Pricing was very reasonable. I would gladly call All Star for any jobs in the future. © 2019 All Star Plumbing. All Rights Reserved. Website Designed by Venta Marketing.